International Wota brings us news from the official H!P site: Mano Erina indies singles to be sold at Tower Records. The article on the official H!P site. It's a slow takeover.... but it's happening! 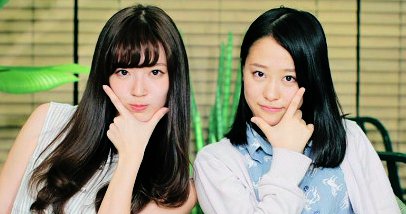 I really want Manoeri to become prominent in H!P, so I'm glad they are giving her all this publicity without immediately throwing her into major releases, etc. This seems like it could be a good plan! Yet another Mano Erina "Mano Piano" live video. I'm really not sure what to think of her. She's older than she looks, that's kinda weird sometimes. She kinda creeps me out at the end of the yorosen episodes with the mano point. It seems like she's trying to be the ultimate perfect idol. But she does seem genuine, not faked or manufactured, so that's good.. I guess. A bit boring maybe? It's cute when she plays the piano, but I'm not blown away by her vocals at all. Conclusion? No idea. Do I like her? Not sure yet. Will I keep an eye on her? Yes. The sale starts at the fan club event "Mano Friends Party vol. 3". H!O has Manoeri's latest blog entries translated! click! Reading her blog makes me love her even more. She even plays Pokemon/Animal Crossing to pass the time. I can't wait for her real debut. She has shot up in my ranks A LOT lately. She may not have a "star" voice, but it's fresh and I love the 80's idol pop feel her songs have had so far. What? She plays Animal crossing too?! Anyone know where to find her singles on Play-Asia? They have such crappy searching there, I can't find her stuff anymore. All her singles until now are indies releases, so they are not sold through regular channels. The official H!P shops sell them, but they do not ship outside Japan. You can try a reseller on eBay for example. I saw "Manopiano" on sale there though once, that's why I'm trying to find it again. If they once had the single on sale and now it is sold out, they may have a hard time getting more, as there is no official distributor. The official Up-Front shop e-Line UP! has the single for sale (link). Only available in Japan or through someone in Japan who can act as an intermediary. I guess it's the auctions for me then, I was just trying to avoid that because of the killer shipping prices Thanks! I'm a bit unhappy with her PB. Firstly, I like most of her other magazine pics better than the PB previews so far (except for the pigtail picture). Secondly, I thought that with Manoeri UFA would've had the perfect chance to go a bit different route. Remember when Nacchi released PBs that didn't have any bikini pictures? Or Yossi's PBs? I think they could've done that with Manoeri, especially because her image so far has been so innocent and she is already different from others in H!P because she plays a piano, does acting, her songs are distinguishably manoerilike, and she has/had a Pocky campaign... Idk, when those first bikini pics popped up it was like "oh. So nothing new then." A disappointment. If they played their cards wisely with Manoeri, which is what I think they've done so far all except for that PB, I think they might be able to attract new kinds of fans that usually wouldn't look at anything H!P. Female fans who turned their backs on H!P because it just wasn't cool anymore. But I think UFA might be making a mistake trying to cater both for the bikini pic loving wota, and for other kind of fans. And I dunno, I'm a total perv right, but even I had no real interest in seeing Manoeri in bikini. I mean she just isn't that type! I think her fans would've bought her PB even if she was fully clothed in it, because she really is THAT cute. I think the PB is just a bit pointless and the management is flushing down some of the things they could've achieved with Manoeri otherwise. She could've been something DIFFERENT.